GIANTS Software is showing off some of Farming Simulator 19‘s new gameplay features in a short “featurette” video that highlights some of the features that have previously been discussed by the developer, but not shown in action to the wider public. 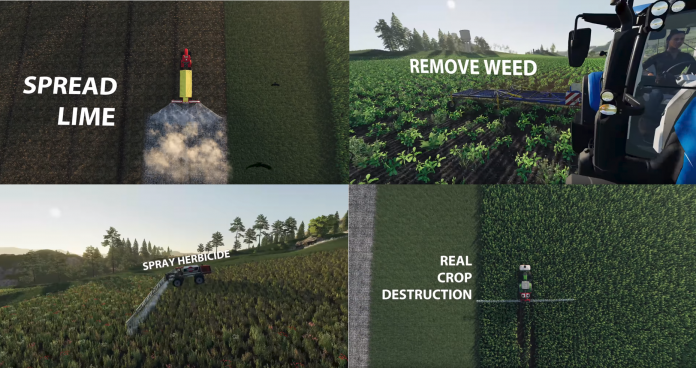 The video, simply called “New Field Interactions”, demonstrates a number of the new activities that players can engage in to care for their virtual crops: spreading lime, removing weeds with a mechanical weeder, and spraying herbicide. To accompany this, GIANTS also takes a moment to show off the new crop destruction system, which has been seen in previous Farming Simulator games as a mod, but never as part of the base package. Fans who follow the series closely have seen bits and pieces of these new features in past videos, such as the Gamescom trailer and gameplay demo as well as the “Harvesting Crops” gameplay trailer. This video provides another look, and lets players get an idea of how the different activities will play out. Spreading lime is similar to spreading solid fertilizer, however it will only need to be done after every third harvest on a field. To account for the extra work involved, GIANTS has reduced the number of fertilizer stages from 3 to 2, which I think is a smart move given that players will now have to contend with lime, plowing, fertilizing, and weed control. However, plowing will only be necessary when planting and harvesting root crops (i.e., potatoes and sugar beets), though exactly how often plowing will be required hasn’t been mentioned yet. As previously discussed in a developer blog from GIANTS, weeds will need to be addressed prior to harvest. Young weeds can be removed by a mechanical weeder, while older, more established weeds will need to be sprayed with herbicide. If you don’t, you’ll lose 20% of the yield on that field. You’ll need to be sure to get rid of them before the crop is ready for harvest too – you won’t be able to spray them once the crops have fully grown, and will be forced to harvest them and take the yield penalty. 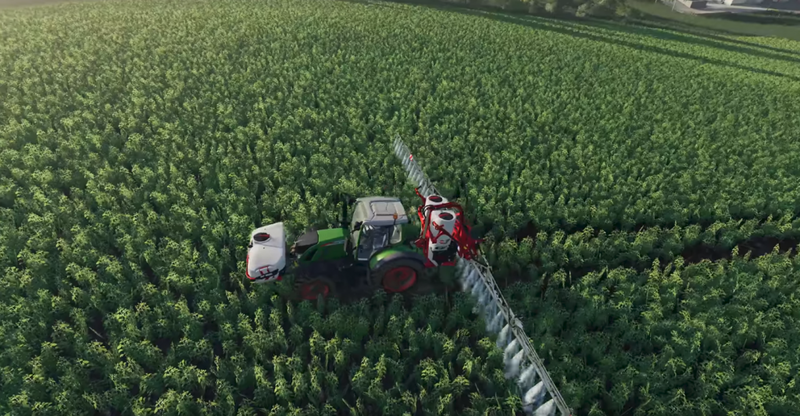 One thing I particularly liked about the spraying demonstration in the video, is that you can see the weeds hitting the boom of the sprayer and contacting it, bending out of its way. This is just a small touch, but it’s another tiny step that enhances the realism in the game. Finally, the video shows off the crop destruction system, which was a popular mod in previous games but is now featured in the base game for Farming Simulator 19. First we’re shown a tractor spraying with wide tires, and see tracks of destructed crops (often called “tramlines”) left behind. The crops essentially disappear from the field, thereby lowering the yield. The video then shows the tires being changed to narrow tires (or “care tires”), and when we return to the field we see that the crops are no longer being destroyed by the tires. This means it will be very important for players to either follow the same tramlines when performing fieldwork to minimize crop destruction, or use care tires on all their machines. 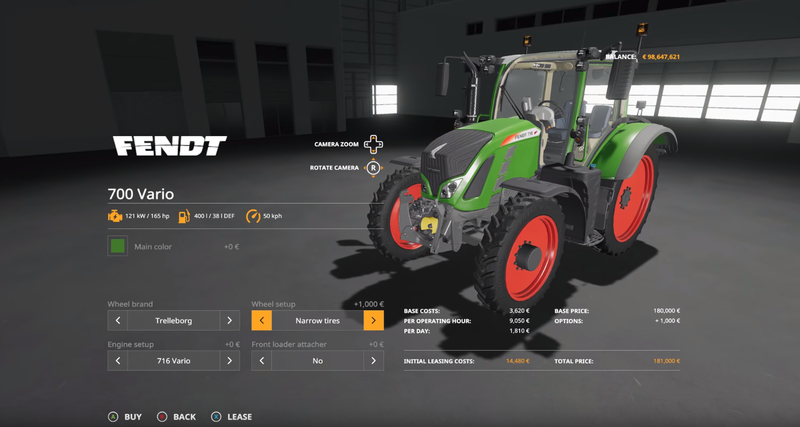 The short video mostly contained equipment that had previously been seen – either in the equipment list on the Farming Simulator website, previous videos, or fact sheets – but it did show us the Fendt 700 Vario series tractor and the Case IH Puma in-game for the first time. The game continues to impress me visually, with some truly beautiful scenic shots coupled with great vehicle models. This video also shows the train moving while the tractor is completing field work, suggesting that the trains will indeed move dynamically when the player is attending to other tasks, rather than simply sitting in place as they did in Farming Simulator 17. Farming Simulator 19 arrives on PC, Mac, PS4 and Xbox One on November 20 – be sure to stay tuned to Scholarly Gamers for more news leading up to release!